Alpha Sigma Alpha Sorority is connected to members and friends throughout many social media outlets. Be sure to connect with our official social media accounts to keep up-to-date with everything Alpha Sigma Alpha! Alpha Sigma Alpha encourages its membership to have a Facebook account, LIKE the Alpha Sigma Alpha Sorority Facebook Page and be an engaged fan to keep up-to-date with Alpha Sigma Alpha and engage their communities across the world. Facebook is a fluid, ever-changing and updated social media platform at which all users must pay attention in order to get the most from it. While Instagram can be accessed from a Desktop, it is only available for use through a mobile device. You can download the app for free in the Apple App Store and Google Play store. Once you have downloaded the app, simply create a username and password and begin capturing the world through your eyes! Alpha Sigma Alpha encourages its membership to have a Twitter account to keep up-to-date with Alpha Sigma Alpha and engage their communities across the world. To follow Alpha Sigma Alpha conversations on Twitter, you can follow along by clicking specified hashtags. Learn more about LinkedIn and its network. 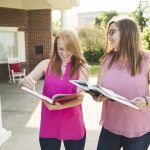 Alpha Sigma Alpha encourages its membership to have a LinkedIn account to also connect with Alpha Sigma Alpha members in similar career fields or in similar regions by joining the official Alpha Sigma Alpha Sorority group. Join the Alpha Sigma Alpha LinkedIn group. Move your cursor over Groups at the top of your homepage, and selectGroups Directory from the dropdown menu. Type in “Alpha Sigma Alpha Sorority” in the Search box in the top right hand corner of the screen or using the Search Keywords box on the left. Click Join Group on the group Discussions page or anywhere you see the button. Or respond to an invitation from a group member or manager. Your request to join will be sent and approved by the group’s owner and administrator. This is an excerpt from the Help section of LinkedIn.com. To learn more about getting started with LinkedIn, click here. Pinterest is a virtual pinboard. Pinterest allows you to organize and share all the beautiful things you find on the web. You can browse boards created by other people to discover new things and get inspiration from people who share your interests. Alpha Sigma Alpha uses Pinterest for every member and friend to enjoy. We find inspiration from our history, values and aims and love seeing what our members pin as well! YouTube provides a forum for people to connect, inform, and inspire others across the globe and acts as a distribution platform for original content creators and advertisers large and small. Learn more about YouTube and how to navigate it. The Alpha Sigma Alpha channel of YouTube is your platform to browse videos created by the official Alpha Sigma Alpha production group, AΣALive! as well as shared videos from members and chapters of Alpha Sigma Alpha. AΣALive! video content ranges from promotional content for upcoming national events to branding to tutorials about collegiate chapter operations.